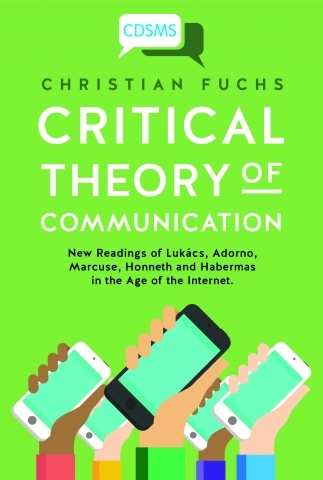 In Critical Theory of Communication, Christian Fuchs explores how the theories of five key thinkers from the Frankfurt School – Georg Lukács, Theodor Adorno, Herbert Marcuse, Axel Honneth and Jürgen Habermas – can contribute to a critical understanding of contemporary media. While the book succeeds in underscoring the need to continue re-examining the vital contributions of these theorists, it does not always fully convince of their relevance to more specific aspects of the digital age, argues Adam Hodgkin. Critical Theory of Communication: New Readings of Lukacs, Adorno, Marcuse, Honneth and Habermas in the Age of the Internet. Christian Fuchs. University of Westminster Press. 2016. In Critical Theory of Communication, Christian Fuchs reviews and analyses the cultural, communication and media theories of Georg Lukács, Theodor Adorno, Herbert Marcuse, Axel Honneth, Jürgen Habermas and some lesser figures from the Frankfurt School. He also gives attention to other broadly sympathetic thinkers who are not normally regarded as belonging to this strand of Marxist thought: for example, Raymond Williams, Gaston Baudrillard and Lev Vygotsky. Fuchs’s aim is to introduce these scholars to demonstrate that their theoretical positions have current applicability to contemporary understandings of the internet, digital culture and, most particularly, social media. The two most important theoretical poles in Fuchs’s exposition are Lukács and Marcuse, and behind them the foundational thinkers for the critical theory approach, Karl Marx and Hegel, with Friedrich Nietzsche and Martin Heidegger lurking off-stage. There is a clear challenge for Fuchs’s project: none of these thinkers could in any way have understood the ways in which digital technology would become such a transformative and globalised condition of contemporary society. Even Habermas, who has given a central role to communication, the public sphere and rational action in an information world, published his most important works before the web was invented, long before we discovered trolling, cyber-bullying, ‘liking’ and phishing. So one immediate challenge for Fuchs’s approach is the need for a strong effort of interpretive imagination if we are to refocus Lukács’s convoluted Hegelian apparatus on the current manifestations of popular culture. Fuchs is particularly keen to draw the reader’s attention to Lukács’s last work, a magnum opus entitled Ontology of Social Being (1978), running to 1400 pages in the German edition. Only a third has so far been translated into English, and it seems to have had little impact in social theory or even Marxist-materialist philosophy. Indeed, the seminal Lukács work to which Adorno, Marcuse, Horkheimer and others were reacting is the much earlier History and Class Consciousness (1923). Fuchs cites as evidence of neglect the astonishing imbalance in citations of these two works, as shown by Google Scholar: over 5,000 citations of the latter against fewer than twenty of the ‘unfortunately neglected’ Ontology. Yet, for Fuchs, this last book was a late flowering and is of key relevance to Marxist cultural theory. This claim relies in part on the key role that Lukács gives to labour and the use of tools in the evolution and development of social systems and an ‘ontology’ which is not natural, merely physical or strictly biological. Lukacs writes, or is translated, in a heavy Hegelian manner, but Fuchs makes the case that this is a book to be considered and read seriously. However the main themes in Ontology — labour, tools, language and the evolution of consciousness and of the social — appear to have at least as much relevance to aspects of contemporary digital culture and economy not touched upon in Fuchs’s primarily (social) media orientation, including themes such as globalisation, automation, virtualisation and robotics. Fuchs also convinces in showing that we should look more closely at Marcuse’s critiques of commercial culture. The Frankfurt School is not dead — these thinkers do merit further reading, and Lukács and Marcuse look the pick of the bunch. For these reasons, Fuchs’s book earns its subtitle: New Readings of Lukács, Adorno, Marcuse, Honneth and Habermas in the Age of the Internet. We should read these thinkers because they articulated fundamental political, ideological and, at their base, moral critiques of capitalism and twentieth-century culture. As we continue through this era of digital culture, largely but not entirely profit-driven, we need to look at some of these long-standing planes of critique. However, while some of the problems they identified have deepened, they were all writing well before the development of new digital, and profoundly different, forms of mass culture. Where Fuchs is less successful is in demonstrating how their theoretical frameworks can, or even could, have relevance to the specific features of this. The international division of labour involves Congolese slave workers who mine minerals that form the physical foundation of mobile phones, computers and laptops. Assemblage workers, such as the highly exploited Foxconn workers in China, assemble the ICT components […] into whole technologies. Consumers put to use both hardware and software for various purposes. On advertising-driven Internet platforms, these users are also workers, whose usage labour creates a data commodity that advertisement-driven platforms such as Facebook, Weibo, Twitter or YouTube sell as commodities to their clients (62). This is not a helpful model for the economic framework of contemporary digital culture: it is essentially descriptive with some revolutionary ‘colour’ added to the interlocking account of global logistics and chains of added value. When our economic model or our topology of social relations becomes so all-embracing that any social act is ‘work’, the explanatory power of the categories of ‘labour’, ‘profit’ and ‘value’ lose their grip. Note that a similar mutually interdependent, exploitative, multinational model could be constructed for the airline industry (with tourists doing aeronautical work as they fly to holiday destinations) or the pharmaceutical industry (with patients in a ‘precarious’ way doing medical labour by consuming medicines or submitting to randomised control trials). Fuchs makes a similar mistake in sketching the ways in which the celebrity culture of Twitter and Facebook gives rise to a ‘repressive tolerance’ of false connectivity and the mere appearance of democracy and equality that is, in fact, serving a ‘Facebook capitalism’. ‘Repressive tolerance’ is a valid concept and may be a useful way of approaching the hot topics of ‘fake news’ and ‘consumer bubbles’, but these clear negatives are only part of the story. A critical theory should provide a nuanced picture of the ways these new institutions appear to breed their own ‘issues’ from their digital character: they invent vices as a by-product of their virtues. Fuchs’s notion of ‘Facebook capitalism’ is also worth some attention; but it is too easy to suppose we have understood what is problematic about these businesses when we note that they rely on a capitalist and consumer-driven advertising engine. We would have more confidence in a critical theory of digital culture if it could give evidence for the compelling and innovative ways in which these institutions formed. Facebook, Twitter and now Snapchat acquired or assumed advertising technologies, but they did not start that way, and at base they are not experienced or chosen by their users for this advertising potential. A critical theory would explain why the forms of social practice we find in these spaces have nonetheless become so sticky and compelling. Fuchs has given us a useful and helpful survey of some of the key thinkers from the Frankfurt School. His guidance will be particularly useful to those of us who need a reminder of the Hegelian, Marxist context in which much of this critical theory was grounded. The most surprising omission from the range of thinkers is Walter Benjamin, whom many would see as having been the most significant cultural and literary theorist in the School, and one who has significance to digital culture. The absence of Benjamin is so glaring that it is a mistake not to have provided some justification for it: his inclusion might have helped to give cutting edge to the book’s aim of developing a new critical theory of digital culture. Adam Hodgkin is the chairman of London-based Exact Editions. He was previously philosophy editor, then electronic publisher at Oxford University Press, before founding or co-founding Cherwell Scientific Publishing, xrefer and Exact Editions. He has recently published Following Searle on Twitter: How Words Create Digital Institutions (Chicago UP, 2017) and he tweets as @adamhodgkin.